Signum Classics continues its fruitful collaboration with Ian Page and his recently re-named band The Mozartists, who you’ll find listed under the ‘Classical Opera’ name in previous editions of this series. Having previously enjoyed releases such as the unusual Il Sogno di Scipione and others I was intrigued to hear what the team would do with Bastien und Bastienne, now one of the better known of Mozart’s youthful operatic output thanks in part to the discovery of its autograph manuscript, lost until the 1980s. Mozart’s Grabmusik is one of those pieces more usually found in huge ‘complete edition’ box sets which, on this showing, is rather a shame. The music was possibly written as the result of a challenge by the Prince of Salzburg who, not willing to credit little Mozart with his talent, supposedly shut him away to compose in enforced isolation for a week. The result was ‘a very capital oratorio’ thought to be this work which, as the booklet informs us, “takes the form of a dialogue between a tormented soul, who is desperately lamenting the tragedy of Christ’s death, and an angel.” This is a surprisingly wide-ranging drama from the 11-year old Mozart, the bass character of Die Seele both vulnerable and bitter, and ably performed here by Jacques Imbealio who is deeply sensitive to the subtleties in the part but neatly avoids over-egging its clear emotions. Anna Lucia Richter’s voice is perfect as Der Engel, both as a consoling influence, and ultimately as the generous messenger of salvation and forgiveness. This is an intimate gem of a piece, and I can’t say I’ve heard it done better than in this recording. Bastien und Bastienne was commissioned by the German physician Franz Anton Mesmer, but Ian Page’s booklet notes take us back though the history of the origins of the narrative, the confusions surrounding its various versions and revisions – details which give plenty of background to what is in fact quite simple story. Shepherdess Bastienne has been left alone by her sweetheart, the shepherd Bastien, who fancies some other lady in the big city. She asks for advice from the fortune-teller Colas, who stirs things up for both of our leading characters. They spend some time brushing each other off and generally behaving like drama-queen teenagers until eventually admitting they still love each other, and all finally celebrate this happy resolution. There is a fair bit of spoken dialogue in this opera, and even with the well-spoken clarity of the players it is useful to have the booklet for its translation of the text. The acting is kept nicely in proportion, with a nice sense of spontaneity in those essential little laughs and asides, and there is a delightfully natural sense of flow between music and spoken word. My main reference for this opera was for a long time the Sony Classical release including Edita Gruberova with the Franz Liszt Chamber Orchestra conducted by Raymond Leppard, and it is interesting to return to this version, which by comparison with Ian Page’s now seems oddly out of proportion with its grander orchestral sound. This Sony recording is still very enjoyable, but having been reminded that Bastien und Bastienne was written for performance at a private residence rather than a theatre now seems a bit big-boned. The acting is wider-ranging, with a rather creepy Colas from László Polgár and a more girlishly coquettish Bastienne from Gruberova. Anna Lucia Richter is more petulant and cunning, with Darren Jeffrey a more jovial Colas. The Classical Opera orchestra is more compact but by no means thin sounding, with its clean, vibrato-free strings still creating a warm and expressive atmosphere. Alessandro Fischer is a suitably errant and incredulous Bastien, his characterisation very much a match for the others, and with a lightness of singing voice that allows at least an illusion of youthfulness. There are but a few recordings of Bastien und Bastienne around. Philips Classics has a famous version conducted by Uwe Christian Harrer which now sounds rather too stately in terms of pace, and the young voices of Dominik Orieschnig and others don’t really cut the mustard for repeated listening. The Naïve label has a DVD release reviewed here. 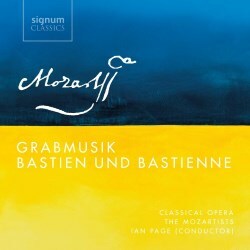 If you are collecting this Signum edition then acquiring this recording is a must, and if you are looking for a superb performance of one of Mozart’s young productions then this is very much the best place to invest.